Are you looking for inexpensive gifts for movie lovers? I’ve created a list of Redbox gifts that you can put together in minutes. I’ve been a Redbox customer for nearly 10 years! Redbox offers convenient and affordable new-release movie and video game rentals. With movie rentals for just $1.75 a night, renting a new-release movie from Redbox is half the cost of a new-release cable movie rental, and doesn’t require a monthly subscription fee. Stream Movies & TV Shows: Redbox On Demand, delivers an even broader selection of movies and TV shows through video on demand (VOD). Buy Movies & Games: Buy previously-viewed movies and video games for amazingly low prices. Simply browse and reserve the titles you want to purchase and then pick up the discs at the box you selected. 4K UHD Rentals: Watch movies in even better quality. 4K Ultra HD rentals are available in six test markets for just $2.50 per night. Test markets include Los Angeles, Seattle, Austin, Detroit, Miami, and New York City. Did you know that you can buy Redbox codes in bulk on their website? These inexpensive codes can then be given away and used for a one-day rental. I love these creative ways to give Redbox codes! And they are super affordable since they only cost $1.75 each! Create a fun movie night gift basket with Redbox codes! Just click on one of the images below to print these free printable Redbox movie tickets to put together cute and inexpensive Redbox gifts in minutes. 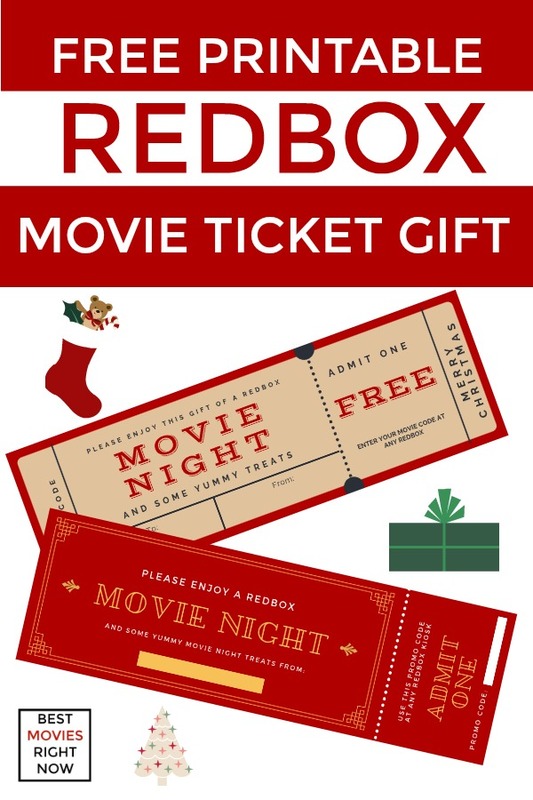 Click here to print this free printable Redbox movie ticket in red. Click here to print this free printable Redbox movie ticket in pink/red. 1. Print the movie tickets. 2. Purchase a code from Redbox. 3. Write the code in the designated box on the ticket. 4. Attach a bag of microwave popcorn. Now you have a creative, inexpensive, and adorable way to say thanks to the people in your life at Christmas. I am not crafty at all, so I never attempt to “make” something. However, a movie night gift basket is totally something I can pull off. I think it would be cool to add a gift basket with popcorn and candy, etc. Your gift could include Redbox codes, a pizza or other restaurant gift card, popcorn, and candy. You could make it as expensive or affordable as you’d like. No matter what you add to your gift basket, the Redbox codes only cost $1.75 each. These Redbox gift ideas also make for an easy and affordable teacher gift or neighbor gift. 2. Select the “Buy Promo Codes” on the right (rather than E-Gift Cards). 3. Select the number of codes you want to buy. The options include 5, 10, 20, and 50. 4. Email the codes to yourself, so you can distribute them how you wish. Really, it’s that easy to give printable Redbox gift cards and makes for an extremely affordable gift. This would make an awesome Redbox Christmas gift. Don’t have time to make any Redbox gifts? Just buy this one which includes one Redbox code and all the snacks pictured. This would be great for a family Christmas present. Get this Redbox movie night gift basket. How do you plan to give Redbox gifts?